There are 25 Assisted Living Facilities in the Memphis area, with 24 in Memphis and 1 nearby. The average cost of assisted living in Memphis is $3,132 per month. This is lower than the national median of $3,346. To help you with your search, browse the 158 reviews below for assisted living facilities in Memphis. On average, consumers rate assisted living in Memphis 4.1 out of 5 stars. Better rated regions include Bartlett with an average rating of 4.7 out of 5 stars. Caring.com has helped 18 families in Memphis find high-quality senior care. To speak with one of our Family Advisors about assisted living options and costs in Memphis, call (855) 863-8283. Home to Graceland, Beale Street Historic District and the National Civil Rights Museum, Memphis has no shortage of historic and cultural attractions for residents to enjoy. The city has more than 652,000 residents, and more than 11 percent of them are 65 years or older. For residents in that age bracket who need or desire assisted living care, Memphis is home to 24 assisted living facilities. In Memphis, as in all of Tennessee, assisted living facilities are regulated by the Tennessee Department of Health and are classified either as assisted care living facilities or as residential homes for the aged. Memphis is a member of the AARP Network of Age-Friendly Communities, meaning that its elected leadership “has made the commitment to actively work toward making their town, city or county a great place for people of all ages,” according to AARP. The overall cost of living in Memphis is 16 percent lower than the national average. The city's housing prices, which are less than half of what one can find in a typical U.S. city, are largely responsible for this discrepancy. The one area where Memphis is more expensive than average is health care. This is something that seniors with high medical bills may want to look into. Memphis is known for hot, humid summers. The average July high is over 90 degrees, which is an important consideration for seniors who may prefer a milder climate or who are sensitive to heat. However, for those who enjoy a variety of weather, Memphis offers a true four-season climate. Seniors in Memphis do not pay state income taxes on their Social Security benefits. This friendly tax treatment leaves residents with more money available to put toward quality health care. Memphis's violent crime rate is 85.7 out of 100, and its property crime rate is 81.1 out of 100. Both of these numbers vastly exceed the national averages of 22.7 and 35.4, which may be a cause for concern for safety-conscious seniors. The Memphis area is home to world-class medical facilities, including Baptist Memorial Hospital, in the event of medical emergencies or illness. Assisted Living costs in Memphis start around $3,132 per month on average, while the nationwide average cost of assisted living is $4,000 per month, according to the latest figures from Genworth’s Cost of Care Survey. It’s important to note that assisted living rates in Memphis and the surrounding suburbs can vary widely based on factors such as location, the level of care needed, apartment size and the types of amenities offered at each community. 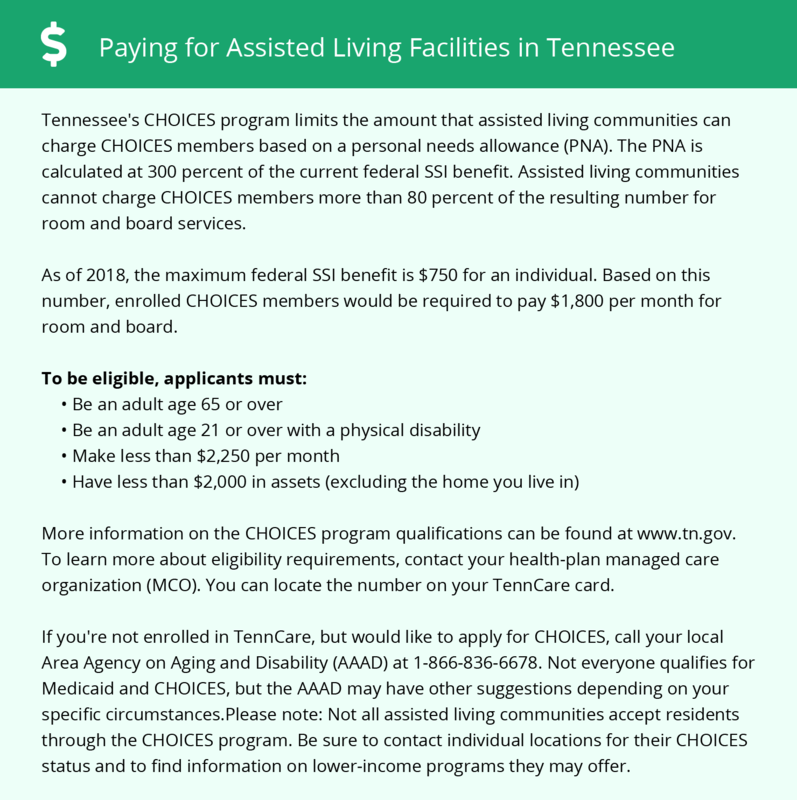 Seniors who reside in assisted living in Memphis may be eligible for government funding assistance from the CHOICES program, which is offered under Medicaid Waiver 1115. Memphis and the surrounding area are home to numerous government agencies and non-profit organizations offering help for seniors searching for or currently residing in an assisted living community. These organizations can also provide assistance in a number of other eldercare services such as geriatric care management, elder law advice, estate planning, finding home care and health and wellness programs. To see a list of free assisted living resources in Memphis, please visit our Assisted Living in Tennessee page. Memphis-area assisted living communities must adhere to the comprehensive set of state laws and regulations that all assisted living communities in Tennessee are required to follow. Visit our Assisted Living in Tennessee page for more information about these laws.